Electric cars have been a dream of those who wish to cut down on gasoline usage. It now appears that Israel is well on its way to establishing the infrastructure that would make electric car ownership practical. 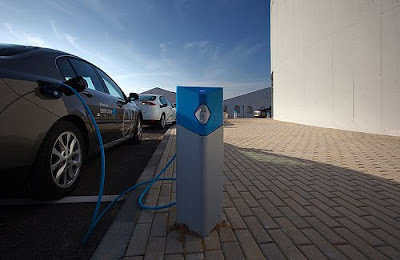 Associated Press reports that Israel, in conjunction with a California based company called Better Place will be setting up dozens of recharge stations all across Israel, where owners of electric cars will be able to park and charge their cars. For longer trips, there will be stations where a machine will remove the car's lithium ion battery and replace it with a fully charged one, enabling a traveler to go on his way in the same amount of time a regular driver would need to fill up his gas tank. Associated Press reports as follows on the upcoming development in Israel. "Better Place has said users will pay for a monthly package that will include the price of the car, the battery and use of the grid. But it has yet to announce how much all of this will cost, saying only that the price will be equal to or less than the price of a regular car. The company, founded by Israel-American businessman Shai Agassi, a former top executive at software giant SAP AG, raised $350 million from an HSBC-led investor consortium last month, one of the largest clean-tech investments in history. The new financing values Better Place at $1.25 billion. Speaking Sunday, Agassi said his goal was to help end global dependence on oil." Up until now, "green friendly" cars have been so expensive that their purchase has typically been a political statement made by those who can afford such gestures. The Israeli program , with its electronic grid promises a model that will be far more affordable to a wider range of automobile owners. It is fortunate that Israelis are reacting with creativity to their difficult international situation. If they are successful, it will provide great benefits for the rest of the world. Implementing an energy grid across a small country will be a prototype for those who wish to duplicate such a model elsewhere. What is most interesting is that it was the economic situation in that part of the world that is providing the incentive for Israel's electric car grid. It is not a government mandate or a government program that produced the Israeli prototype but a group of investors with an eye on the bottom line as well as their own idealistic motives. Market driven changes tend to be far more thorough and long lasting. My dream is that one day, blue collar consumers will be able to "go green" in a manner that impacts positively on their monthly budget. I wish "Better Place" success in their undertaking in Israel. and I hope to see something similar in the US and elsewhere.